Moghlai Dinner Buffet At Rs. 295 Only is an event that took place on 31-Mar-2007 in Hyderabad. 3 Veg salads, 3 non veg salads, and 1 green salad. 4 non veg dishes (mutton, fish, chicken, egg based) such as egg-biryani, Murg Shahi Kurma, Kadai Murg, Fish Amritsari, Fish Jalandhari, egg-bhurji etc. Pig out and find the appetite to fight or to love, like a Babar or a Shah Jahan. For further details, please contact 6651-5151, 2375-7575. Be the first to comment on Moghlai Dinner Buffet At Rs. 295 Only! Just use the simple form below. fullhyd.com has 700,000+ monthly visits. 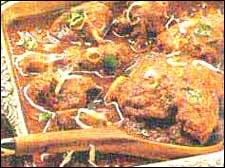 Tell Hyderabad what you feel about Moghlai Dinner Buffet At Rs. 295 Only!